Official artwork of a Fire Piranha Plant from New Super Mario Bros. U. A Fire Piranha Plant (also called a Fire Piranha or Venus Fire Trap) is a variety of Piranha Plant that can shoot fireballs, and some have the ability to fire three at a time. They come in either green or red varieties. Its original name, Venus Fire Trap, is a play on the name of a real life carnivorous plant, the Venus flytrap. The Ice Piranha Plant is the polar opposite of the Fire Piranha Plant. 1.4.2 Mario vs. Donkey Kong: Minis March Again! 1.4.3 Mario vs. Donkey Kong: Mini-Land Mayhem! Artwork of a Venus Fire Trap, from Super Mario Bros. 3. In their first appearance in Super Mario Bros. 3, Venus Fire Traps appear as common enemies in most worlds. Their attack pattern basically consists of hiding in Warp Pipes, much like regular Piranha Plants, and, when Mario approaches, rising from the pipe and spitting an unstoppable fireball in his direction. Like regular Piranha Plants, they can only be defeated with power-ups, and depending on how tall they are, appear in red or green. In some levels, Venus Fire Traps can spit two times in a row, and some inhabit quicksand instead of pipes. Aside from the enemies, the king of Pipe Land was also transformed into an orange-headed Venus Fire Trap with a small pipe by Ludwig von Koopa in the original NES version of the game. In Super Mario Land 2: 6 Golden Coins, Venus Fire Traps once again appear as common enemies and have the same attack pattern as in Super Mario Bros. 3. Unique to this game, they appear to have spikes on their heads, but only in the in-game sprites; this may be to justify Mario's inability to jump on them despite them not biting upwards. Venus Fire Trap statues appear in Mario's castle; like their living counterparts, they spit fireballs, although they also come in comparatively big and small sizes, and are limited to shooting their much larger fireballs straight forwards. While ordinary Venus Fire Traps do not appear in Super Mario 64 or its remake, large and small versions appear. In New Super Mario Bros., Venus Fire Traps appear as uncommon enemies, and the only grounded Venus Fire Traps appears at World 2-6 blocking a Star Coin, but they reappear in pipes at World 3-B, World 5-Castle, and World 6-3. They attack and behave in the same way as in Super Mario Bros. 3. They can be defeated with a Fire Flower, Starman, Shell Dash, or by Mega Mario or Luigi. Two Venus Fire Traps from New Super Mario Bros. Wii. In New Super Mario Bros. Wii, they behave the same as in New Super Mario Bros. and can be defeated in the same way as last time; however, they can now be frozen via Penguin Suit or Ice Flower. They first appear in World 1-3. Venus Fire Traps can also be helpful to the player because they can be found in dark caves where there are no Light Blocks. The fire these enemies spit can light up a small amount of the room, often revealing secret pipes and pits. Yoshi can swallow the fireball or the Venus Fire Trap itself to be able to spit a fireball out, which can be used to defeat enemies, although this fireball can still hurt other players. Larger versions also reappear in this game; they are the same size as Super Piranha Plants and take three fireballs to destroy. The fireballs they spit are also larger. Just as before, if a Venus Fire Trap is in a pipe, it spits a fireball and briefly retreats into the pipe; if it has no pipe, it spits a fireball then chomps in the air for a few seconds before doing it again. A Fire Piranha Plant from Super Mario 3D Land. Fire Piranha Plants appear in Super Mario 3D Land, with a slight change in appearance. They are now brown with orange spots, likely so they can be differentiated from regular Piranha Plants from afar, as they share the same stance in this game. Some leave behind a Fire Flower when they are defeated by Mario. Venus Fire Traps also appear in New Super Mario Bros. 2. They reuse their appearance from the previous New Super Mario Bros. games, with red and white spots. Big Venus Fire Traps also appear in the game. In World 6-2, using a Gold Ring inside a bonus room turns the Venus Fire Trap into a golden Venus Fire Trap; it acts the same as a normal one, but when it is defeated Coins emerge from the Warp Pipe, like a normal Piranha Plant. Fire Piranha Plants also reappear in New Super Mario Bros. U along with their ice counterparts. They mostly retain their behavior and appearance from their previous New Super Mario Bros. series appearances, except that they always face up while not spitting fireballs. Their fireballs can also melt Ice Blocks. A Fire Piranha Plant from Super Mario 3D World. Fire Piranha Plants return in Super Mario 3D World. In this game they retain their appearance and behavior from Super Mario 3D Land. Fire Piranha Plants reappear in Super Mario Maker and Super Mario Maker for Nintendo 3DS, appearing when the player shakes a Piranha Plant or a Jumping Piranha Plant, depending on which style. Despite never appearing in Super Mario Bros., they are given a new sprite based on the standard Piranha Plant's sprite in that style. Fire Piranha Plants reappear in Super Mario Maker 2. In the Super Mario 3D World style, they are brown with orange spots. A Fire Piranha Plant after being captured by Mario. Fire Piranha Plants appear in Super Mario Odyssey, where they can be found in the Lost Kingdom, the Luncheon Kingdom, and the Metro Kingdom. Unlike in prior 3D games, they look the same as normal Piranha Plants (which do not appear in this game), and when they are about to spit a fireball, their heads glow orange. Cappy will become trapped in a Fire Piranha Plant's mouth if Mario throws him at one, stopping it from spitting fireballs. If a rock is thrown at a Fire Piranha Plant, it will similarly hold it in its mouth, allowing Mario to capture the enemy and use it to shoot fireballs. Throwing Cappy at a fireball that a Fire Piranha Plant spits causes it to be knocked in a different direction. A Venus Fire Trap from The Adventures of Super Mario Bros. 3 episode, "Tag Team Trouble"
Venus Fire Traps make several appearances in The Adventures of Super Mario Bros. 3. 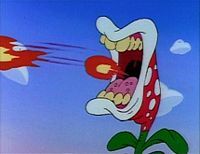 Piranha Plants with fireball exhaling abilities predating Venus Fire Traps also appear in The Super Mario Bros. Super Show!, though though they are referred to as a Magic Piranha Plant. In the Super Mario World television series episode "Fire Sale", Kootie Pie kidnaps Mama Fireplant, a Venus Fire Trap from Dome City, and takes her to her ice castle to warm it up. In the Nintendo Comics System story "The Fish That Should've Gotten Away", a giant green Venus Fire Trap appears among the large group of monsters attacking and chasing Mario. Venus Fire Traps, known as Piranha Plants, are common enemies in Mario vs. Donkey Kong 2: March of the Minis. They are introduced in Mushroom Mayhem and continue to show up frequently throughout the game, most notably in the boss level of Pipe Works. They only have one fireball to shoot (merely called a "ball"), which bounces off an opposing surface and returns into their mouth. Often, two Piranha Plants face each other, passing the ball from one to another. Piranha Plants keep their mouths open until they get their fireball back. In the Pipe Works boss fight, they come out of the pipes on the ceiling and shoot fireballs at the player without waiting for them to come back, retreating in their pipe immediately after launching a fireball. Piranha Plants are completely invincible in this game. Piranha Plants appear to have stout heads comprising most of their body, with leaves on their bottom. Their heads are entirely red, without white spots. Venus Fire Traps, classified along with the variety that does not produce fireballs as Piranha Plants, reappear in Mario vs. Donkey Kong: Minis March Again!. They first appear on the second floor, Sandstone Stroll, and are specific to this floor's construction kit in the Construction Zone. Generally, they have a slimmer appearance than in the previous installment of the series. However, the Piranha Plants that appear in Floor 3 Donkey Kong, the boss level of Magnet Mania (which is almost identical to the boss level of Pipe Works from the predecessor) retain their stout appearance. Piranha Plants behave completely the same as in Mario vs. Donkey Kong 2: March of the Minis. They are also invulnerable to any attacks. Venus Fire Traps, now known as a Piranha with Fire, appear alongside normal Piranha Plants in Mario vs. Donkey Kong: Mini-Land Mayhem! They are first encountered in Warped Mansion. They retain their slim appearance from Minis March Again!, but display white spots on their heads like in their classic appearance. Starting with this game, it is possible to defeat a Piranha with Fire by attacking it with Hammers, a slope slide or by shooting from a Cannon. Fire Piranha Plants appear in Mario vs. Donkey Kong: Tipping Stars, behaving as in previous titles. This time, they are labeled under their current name in the Workshop. They are first found in Crumbling Cavern and do not display any significant difference from their appearance in Mario vs. Donkey Kong: Mini-Land Mayhem! In WarioWare: Twisted!, Venus Fire Traps with their Super Mario Bros. 3 sprites appear in the microgame Super Mario Bros. 3-Lift, as one of the enemies who try to attack the player. They reprise this role in WarioWare Gold. They also may appear in 9-Volt’s Super Mario Maker microgame if the player is instructed to shake a Piranha Plant. In the track Mario Circuit there are two Venus Fire Traps in Warp Pipes that spit fireballs at the racers. A few Fire Piranha Plants appear at the starting line on one of the courses, spitting fireballs into the air. However, they do not affect gameplay. While Venus Fire Traps do not appear as normal enemies in the original Paper Mario, a big unique one called Lava Piranha appears as the boss of Mt. Lavalava. It shares the same name as a regular Venus Fire Trap in the Japanese version, with the English version also implying its connection with them with Goombario and Koopa Koot referring to Lava Piranha in a context that indicated there was more than one. Fire Piranha Plants make their Paper Mario series debut in Paper Mario: Sticker Star under the name of Fire Piranha in the North American version. They appear in Rugged Road and Rumble Volcano. They look like regular Piranha Plants, but will eventually start spitting fireballs at Mario as he gets near them. If any of these fireballs touch Mario, he loses 5 HP. 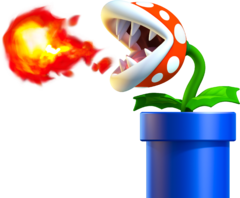 In battle, Fire Piranha Plants can either spew a fiery gas towards Mario or spit out a fireball at him. Fire Piranha Plants return in Paper Mario: Color Splash. They can be found in Redpepper Crater and shoot fireballs at Mario even outside battle, which deals 8 HP of damage. Another one is found in Plum Park inside a bucket, and has to be First Strike-attacked with a hammer in order to not get damaged. The Fire Piranha Plant in Plum Park does not shoot fireballs outside of battle. Fire Piranha Plants also appear in Mario & Luigi: Paper Jam, where they are found in Gloomy Woods. Their paper variants later appear in Twinsy Tropics. Fire Piranha Plants can attack by spitting fireballs at the bros. They can either spit two small fireballs, which target Mario and Luigi, or a large fireball, which targets Paper Mario. The fireballs occasionally cause the burn status ailment. 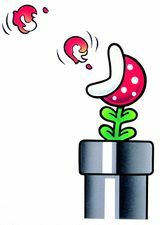 Fire Piranha Plants can also attack by stretching their head backwards, causing it to be pulled forwards quickly into one of the bros., which can be countered with a hammer. Fire Piranha Plants appear in Mario Tennis Aces with their Super Mario 3D Land color scheme. They appear in Piranha Plant Forest as stage hazards where if they catch a ball, they will fire a Zone Shot at the opposing player. They also appear in the mission Rapid Fire in Adventure Mode, where they also fire Zone Shots. In Super Smash Bros. Ultimate, Fire Piranha Plants are mentioned briefly by Viridi during Palutena's Guidance dialogue for Piranha Plant. Piranha Plant also spits fire from its mouth for its back air attack. Level 15 Notice: Stats in parentheses are from the game's Easy Mode. Piranha Plants that spit fireballs in Mario & Luigi: Superstar Saga and in Mario & Luigi: Dream Team are not titled as Venus Fire Traps or Fire Piranha Plants. Pixel art of a Super Mario Bros. 3-style Fire Piranha Plant appears in the world premade for the Super Mario Mash-Up Pack in Minecraft: Wii U Edition and Minecraft: Nintendo Switch Edition. ↑ von Esmarch, Nick. 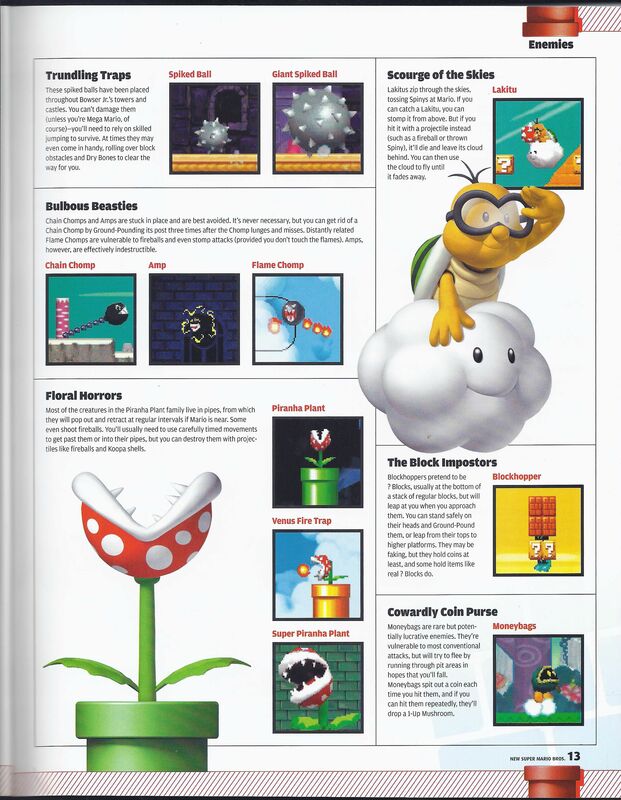 Super Mario 3D Land PRIMA Official Game Guide, page 13. ↑ Shogakukan. 2015. Super Mario Bros. Hyakka: Nintendo Kōshiki Guidebook, pages 37, 76, 115, 146, 160, 181, 196, 211, 227. This page was last edited on April 4, 2019, at 14:44.